Gilroy police on Friday arrested a drug trafficker who was bringing large amounts of methamphetamine into the city, according to the department's anti-crime team. 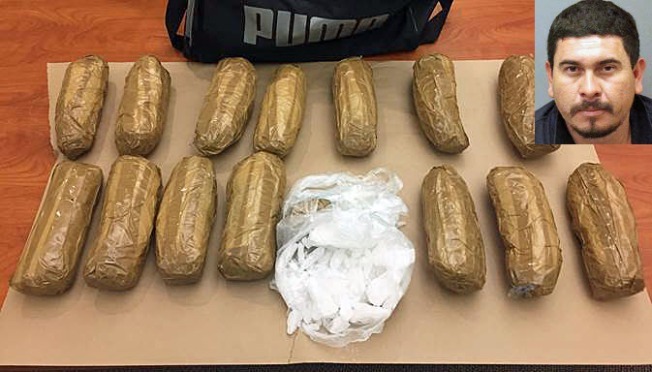 Juan Quinterosicarios, 35, was arrested after being found in possession of 15 pounds of methamphetamine in the area of Tenth and Chestnut streets, police said. Police also searched his home in Monterey County. Gilroy police were assisted by the Santa Clara County Specialized Enforcement Team, the Unified Narcotics Enforcement Team, the U.S. Drug Enforcement Administration, the Peninsula Regional Violence and Narcotics Team and the California Highway Patrol.